After a fall in 2017, Frank’s confidence and mobility declined. Both Frank and his wife Betty were referred to community classes to improve their postural stability. This is their story. In April 2016, Frank and Betty celebrated their Diamond Wedding Anniversary by hosting an afternoon tea for 70 of their family and friends in their local church hall. Instead of presents they asked for donations to The Christie Cancer Research Centre, as Frank and their daughter Jane are both cancer survivors. They were overjoyed when they raised a mammoth £900! 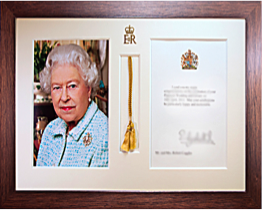 For their anniversary, Frank and Betty received a letter and picture from the queen, of which they are very proud and their daughter had mounted in a frame. In May 2017, Frank, 88, had a fall in the street outside their home in Salford, as he returned home from a short shopping trip. The fall resulted in Frank being taken to hospital via an ambulance where he received care in A&E but was not admitted to hospital. After returning home Betty, 83, took a call from Age UK, checking how they both were since Frank’s fall. They really appreciated the call and Age UK supported the couple to get in touch with Helping Hands. Helping Hands fitted hand rails in their bathroom and outside their garage. The garage hand rail helps Frank walk to the greenhouse where he enjoys growing tomatoes and geraniums. He then sells these to raise money for Salford Royal NHS Foundation Trust and the local church that they attend. Frank was supported by Salford’s Intermediate Care team, while he recovered from his fall. During this time Frank had weekly visits from a physiotherapist. Betty also joined in the exercise sessions. The physiotherapist came every Sunday morning and both Frank and Betty found the exercises useful as well as very enjoyable. Their kitchen is quite narrow and Frank found he was able to do his exercises there because he could hold onto worktops on both sides. Frank and Betty both have several long term conditions but Frank, having had three knee replacements was becoming increasing unstable on his feet and since his fall was losing his confidence. “He is like ‘Jake the peg’” Betty says laughing. In January 2018 the Intermediate Care team referred Betty and Frank to Postural Stability classes, ran by Salford Community Leisure as part of Salford’s new falls service. In March 2018 they began attending a 24 week course, working on stamina, strength and balance. Both Frank and Betty undertook the ‘up and go’ task, which involves getting up off a dining chair and walking forward. By week 12, Frank had improved his time by 13 seconds without the use of a stick! Betty saw a big improvement too, progressing from 18 seconds to 13! Frank and Betty really enjoyed attending the classes and both miss it. Frank will be returning to the Postural Stability class and Betty has been invited to attend a Step Up class. Whilst they wait for their new courses Betty keeps moving by doing what she can in the garden and Frank has mastered getting up out of his easy chair. Betty can’t wait for the next course and Frank is now keen to improve enough to be able to manage without his stick. Salford’s Falls Service was launched in March 2018 and has simplified the way people who have fallen, or at risk of falling, are referred. The service is split into ‘high’ and ‘low’ intensity and can take referrals from people who have fallen previously or who may be unsteady on their feet. Find out more about the service and how to refer.